The public functions, including a full service restaurant, themed bar, lobby lounge, spa, conference rooms and ballroom, as well as back of house spaces have been developed within a two-story masonry base. The material and massing of the base responds to municipal development guidelines, relating in scale and material to the character of the historic city of Hoboken. Rising from the base, a wedge shaped tower maximizes views eastward to Manhattan by virtue of its inflected geometry. The hotel rooms, developed to the standard of the W brand, form the 14-story mid-section of the new tower, the height of which relates to the cornice line of the adjacent properties. The north and south facades of the mid-section of the tower are characterized by abstract fluting formed by full height bay windows included within the typical hotel rooms to further enhance the view. Nine floors of hotel residences form the top of the tower, creating a cornice by virtue of the exterior balconies. Rising above the neighboring structures, the new residences offer unobstructed views north and south. 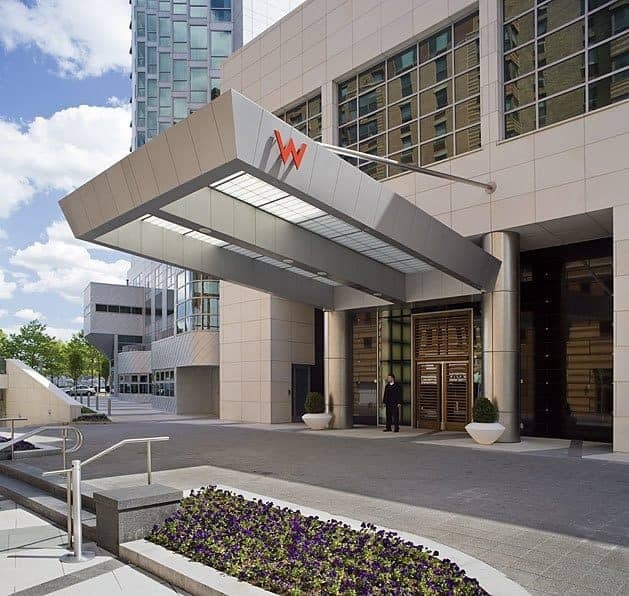 Click here to be directed to the W Hotel and Residences website for more information and a virtual tour (a new tab or window will open).